Yes, Thirty-Three is another oud fragrance but before you click off, please read the next sentence. This is an exceptionally good oud perfume and I’m not someone who is a lover of all things oud-y. Ex-Idolo Perfumes is a new London based niche perfume house established by Matthew Zhuk. Released in April 2013, Thirty-three is the brand’s debut fragrance and is so named because it showcases an oud which was distilled in 1980 and aged for thirty-three years. It also features “wild harvested Chinese oud oil” which Ex Idolo state has not been used in any other modern perfume. BASE: Rare Vintage Ouds, Aged Patchouli, Heliotropin. It has to be said that Thirty-three is extremely well blended. Apart from a burst of mandarin at the start and a beautifully deep red rose accord that persists throughout, the rest of the notes seep seamlessly into the pillowy bed of oud. It is sophisticated and seductive in the mould of the wonderful Rose Oud from By Kilian. While longevity is moderate, it does wear close to the body and I imagine some might prefer greater projection. However, if you favour subtlety and are still looking for that one perfect oud for your collection, then Thirty-three could just be the one you’ve been looking for. 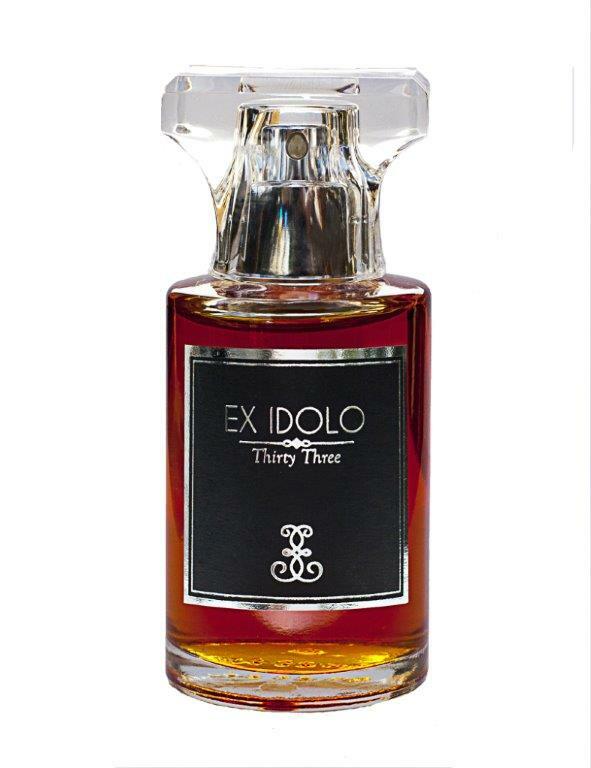 Thirty-three is available at Roullier White, London priced at £90 for a 30ml EdP (samples at £6 each). It is also available online at Luckyscent and Twisted Lily in the US, in stores in Hungary and Canada, with more countries to follow. This entry was posted in By Tara, Fragrance Reviews, Woods and tagged Ex idolo, Fragrance, London, Oud, Perfume, Review. Bookmark the permalink. Hopefully you can try it when you come to London, Val! February?? I have no intention of waiting that long!!!! Ha! Good! I love your enthusiasm, Val. Yes! Loving this already if it is real. A rare find Tara. Oud gets better and better with age. By Zeus, you would never find a 33 year Oud in anything mainstream or even By Killian. Ha, and the patch sounds great and it is now all on a plane. Caoutchouc, what is that? Did I miss that class? Ha! As Lady Jane Grey says, it’s a kind of natural rubber. Matt told me he’s tried to use materials that weren’t scheduled for regulation (yet) so that may well be one of them. 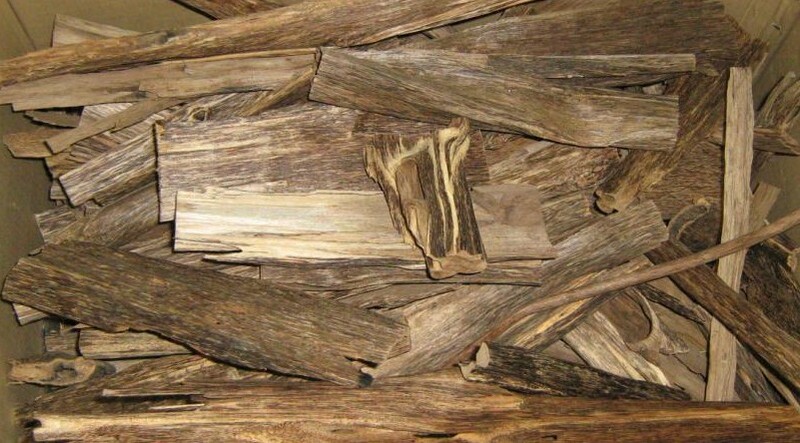 I’d be interested in your thoughts when you get to sample it, as you know and love oud so well. Tara, that’s not the sample you gave me a month ago ? Quite! The Damascus Steel is a bit of poetic license, describing a cold, metallic note – not that I picked up on it. This IS the sample I gave you as I know you are an oud fan. Let me know what you think. BTW I tried Coeur de Vetiver Sacre last Saturday. It was only on paper but I loved it. It was, in fact, very smooth, very rose-y. I didn’t get the Mandarine at all, unfortunately (nor the rubber and steel…). I liked the top and heart part the best – the dry-down is too mellow for my hard-core oud taste. Will spritz some more of it today… Thank you !!! I wondered if it would be a bit too subtle for your tastes and robust skin. I can’t say I got any rubber or steel either. The rose is lovely though. I’m lucky enough to live a 15 minutes walk away from RW and might try that this afternoon. Yes, lucky you Sabine! Let us know your thoughts if you do. Managed to do some sniffing whilst shopping for dinner. It is lovely and I enjoyed the opening with the mandarines, but then it was all a bit too soft for me. I fell in love with gothic bluebells instead. Yes, I think quite a few people will find it rather too quiet. I loved the mandarin in the opening too. Glad you discovered and fell for Union’s Gothic Bluebell. Having tried this one myself, I completely agree with you on this one, especially its surprising softness and subtlety for a perfume with oud. It is very much a ‘whispering’ kind of scent, an ‘oud for wimps’ if you will. Didn’t move me in the way the rose scent called Taif does, so that would be my only criticism – and I can’t put my finger on why. You’re spot on, V. I can’t say it moved me either. I like “whispering oud” and the gorgeous lingering rose note but I didn’t swoon. Strange. Sorry – repetition of ‘this one’. V, I never notice these things unless pointed out! Late to this one, and I’m not sure I’ll get a chance to try Thirty Three, but I am intrigued always why some perfumes move you and some don’t. The ones that do it for you don’t have to be the most sophisticated, challenging or expensive. I can’t explain why I adore EL’s Sensuous and Prada Candy but niche stuff by Ramon Monegal, Francis Kurkdjian and Maria Candida Gentile leaves me cold. Of course there is plenty of niche that I do love. But the thought that some of it is so expensive that I might have to sell a kidney to afford it may be damping down my emotional reaction even before the first spritz! I think we do raise the bar when it comes to the really expensive stuff. We have to really swoon to jusitfy the cost. There’s no accounting for what will move you though, it’s true. It’s not on an intellectual level so it’s tough to explain why some perfumes affect you emotionally while others don’t. Maybe that’s one of the reasons why we love perfume so much and keep pursuing new ones, in the hope we might get that illusive special feeling that makes it all worthwhile. love your comment, A. I wonder too! :). And I agree. Price based expectations do matter! When you love a certain perfume genre, you’re naturally drawn to new interpretations no matter how many there are. It sounds like Roullier White have a great range of niche perfume brands so I’m sure it will be worth going whether you hit it off with Thirty-Three or not. Hope you do though! ooh- aged patchouli, vintage ours! I have to try this. Lovely review, Tara! Thanks, Lavanya! You’d think from the notes list it would be strong stuff but it’s surprisingly quiet. WOW! I wonder how the price is kept so reasonable with such incredibly expensive ingredients. Even the travel to find such rareties must be excruciatingly costly. VERY interested to try this when in London during February 2014, hopefully we can catch up. Good point, Portia. it’s also surprising that it’s not a limited edition considering there can’t be an unlimited supply of 33 year old oud knocking around. I will definitely be around to meet up with you and Val next Feb. Looking forward to it. YAY!! It will be super fun. Late commenting, but I just wanted to say that you and I are on the same page with this one! I tried it randomly, without knowing anything about it, and really quite liked it. Ah, that’s interesting to know you had a similar reaction. It’s so soft and well blended it’s hard not to like it even if you don’t exactly swoon. Unless you prefer the full bodied, animalic ouds, I guess. Call me cynic, but I do not believe this fragrance “showcases an oud which was distilled in 1980 and aged for thirty-three years”… sounds like the usual PR hogwash. Btw what is “Damascus Steel”? Considering it’s the whole concept the fragrance is based around it would be pretty audacious hogwash. Damascus steel is a poetic way of describing a metalic note.